The VoIP Video EVO.NET SDK contains a high performance VoIP and Video conferencing client capable of delivering crystal clear sound and video capturing even for both low and high-bandwidth users. Conaito VoIP Video EVO users are arranged in a tree-structure where each node is a room/channel where users can talk, see Users, send instant messages and share files. Examples of such applications could be Internet phones, conferencing tools, surveillance systems, eLearning systems, or any other type of application where audio and video transmission between networked clients is an essential part of the application. The SDK consists of both a client and a server. 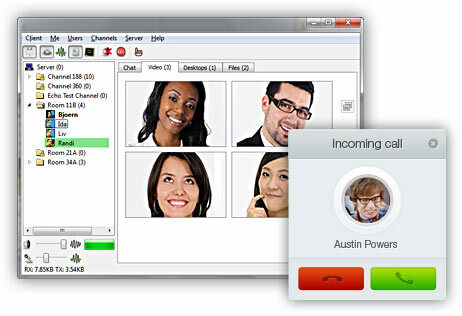 The VoIP Video EVO server is a standalone application which provides user authentication and keeps track of connected clients. It can operate in both LAN or WAN (Internet) environments. Each server instance is capable of serving 1000 simultaneous clients. Having the above features available makes it simple to develop any type of VoIP- and Video-enabled application, like e.g. a teaching tool, live support, chat, meeting tool, a multiplayer game or any other type of application which requires users being able to talk, type messages and send files to each other. For VoIP Video EVO clients to be able to interact with each other they must connect to a VoIP Video EVO server which keeps track of where users are located and forwards voice/video-data packets between clients (p2p is depending possibly!). The VoIP Video EVO server is able to serve 1000 simultaneous clients and can be hosted in both LAN and internet environments. The licensed VoIP Video EVO.NET SDK is available in both an encrypted (Enterprise Secure Edition) and an unencrypted (Enterprise Edition) version. For most applications the unencrypted (Enterprise Edition) version provides enough security in the way that a server and the channels on a server can be password-protected so unauthorized users are denied access. If, however, it is also important that the data being transmitted between clients and the server then it is necessary to use the encrypted (Enterprise Secure Edition) version of the SDK which uses TLS and BlowFish encryption. The API exposed by the VoIP Video clients and VoIP Video EVO Server in both the encrypted (Enterprise Secure Edition) and unencrypted (Enterprise Edition) SDK are exactly the same. Please, don't hesitate trying our VoIP Video EVO.NET SDK at once and get yourself, as well as your customers, the exciting experience of easy, fast and high quality standard applications which VoIP- and Video-enable your application. We hope you enjoy the VoIP Video EVO.NET SDK – A simple way to VoIP- and Video-enable your applications. We have been looking for an easy to develop and powerfull video conferencing sdk and have decided to purchase this SDK.